Our members come from all walks of life, from individuals to corporate. Animalia needs members to continue its work and enable its message to reach a wider audience. 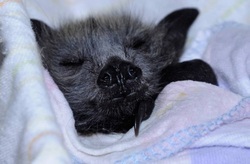 Many fruit bat pups survive electrocution which has killed their mother. Call for assistance if you see a dead bat hanging on power lines Between September -April they may have a pup on board.